A municipal garage built into North Sea sand dunes; robotic parking in West Hollywood; and a community-building, green garage for a healthcare facility are among honorees. (New Orleans, May 15, 2017) – As the 2017 winners of the International Parking Institute’s (IPI) Awards of Excellence illustrate, diverse parking challenges call for a myriad of creative solutions. One winning garage pioneers full automation in a compact space and uses recycled plastic bags and milk jugs in its construction. Another incorporates sand dunes to buffer a Dutch town from the North Sea. Several feature public green spaces that invite community. And all employ state-of-the-art, sustainable solutions that slash energy costs and promote alternative transportation. The awards will be announced at the IPI Conference & Expo in New Orleans May 21-24. Situated behind a new dike and beneath a natural dune, the $16 million Kustwerk Katwijk parking garage is an integral part of the Dutch town of Katwijk’s new water defense system, protecting it from the North Sea and providing beachside parking. 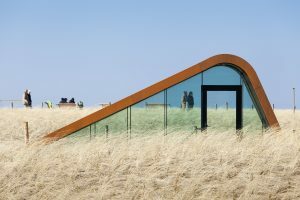 Architect Royal HaskoningDHV’s design integrated the entrances into the dune landscape, incorporating a network of paths that connect five pedestrian entrances with the town and beach. At the entrances, the dune landscape is lifted to create an uninterrupted flow over the roof, ensuring the dunes’ integrity and allowing daylight into the underground garage. The architectural, functional, structural, and installation features of the 670-space garage, designed by Ballast Nedam and ZJA, create a high-quality public space that features integrated wayfinding and maritime-inspired icons and colors. The City of West Hollywood boasts the West Coast’s first fully automated, municipally-run parking structure, serving City Hall visitors, employees, residents, and patrons of local businesses. Built above-grade on a tiny parcel, the compact, 200-space structure uses less than 40 percent of the space of a conventional parking garage and provides a valet-like experience without its usual costs or risks. The $10 million structure incorporates a PARCS (Parking Access Revenue Control) system that is networked to other city parking facilities for ease of use. Visitor parking is validated via electronic kiosk or printed follow-up tickets and keycards are issued to employees and monthly permit holders. An auto court provides short-term, motorcycle, and bicycle parking and a station for the city’s bike share program. The structure’s state-of-the-art, composite wood panels are made from recycled plastic grocery bags and milk jugs; generators provide uninterruptible power supplies for a computer system that’s backed up multiple times daily. Drought-tolerant, native plants provide landscaping that complements both the structure and adjacent 4,000-square-foot community plaza that is used for civic events and public art displays. 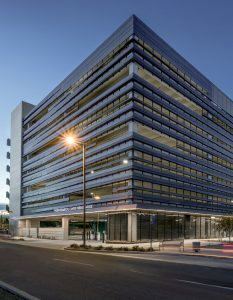 A new, $19 million parking garage serves the Phoenix Biomedical Campus (PBC), a 30-acre urban medical, bioscience, and educational campus designed to accommodate 6 million square feet of biomedical facilities. The eight-level, 397,000-square-foot garage houses 1,211 parking stalls and 2,250 square feet of retail. Two gated entry/exit locations offer three lanes each, one of which is reversible, and a double, park-on ramp further improves circulation patterns. The garage’s design allows for redevelopment of neighboring surface lots into building sites and landscaped open space. A shade canopy covering street-level pedestrian sidewalks and bike lockers features a micro-perforated metal panel that reveals the city skyline and surrounding mountain parks, while filtering the sun and diffusing natural daylight throughout the garage, exceeding the natural ventilation requirements required by code. LED lighting with motion sensors and photocells further reduces energy consumption. Marton & Smith Landscape Architects, Inc. 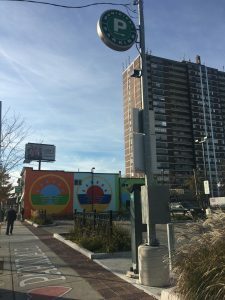 The Toronto Parking Authority (TPA) redeveloped a vacant commercial property into a green, 33-space, surface parking lot in partnership with the local business improvement area and community. 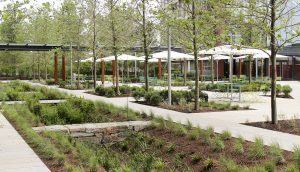 Permeable pavers facilitate sustainable stormwater management; trees reduce urban-heat island effect; and plants chosen for drought tolerance and seasonal interest serve dual functions. A pay-and-display machine accepts credit cards and cash while mobile pay lets users pay, track, and add parking time from their smartphones. LED lighting, low-profile landscaping, and regular security patrols ensure pedestrian and vehicular safety. Tree cover and high-albedo pavers reduce heat and panels accommodate future electric-vehicle charging stations. The lot’s western boundary lot features a mural created through the city’s StreetArt program, helping to decrease vandalism and illegal graffiti. Its design, symbolizing the community’s solidarity, proposes proactive strategies and actions, development without displacement, participatory democracy, decent work, food security, and shared wealth. The $350,000 lot has been widely praised for its creative and innovative aspects, and has inspired other TPA projects now in the design phase. 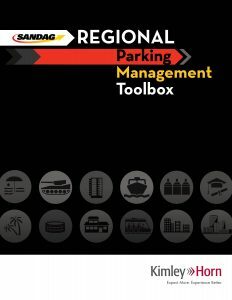 The San Diego Association of Governments (SANDAG) unveiled its comprehensive Regional Parking Management Toolbox in 2014 to help its 18 jurisdictions determine and address specific parking problems. The interactive, online Toolbox provides the cities and county with best practices for managing parking in a variety of settings to help promote smart growth, sustainable development, and alternative transportation choices. For example, the city of Carlsbad is applying the Toolbox’s complete step-by-step process to develop a comprehensive parking management plan for several of its communities. The city of San Diego has implemented innovative parking management strategies that encourage shared mobility. 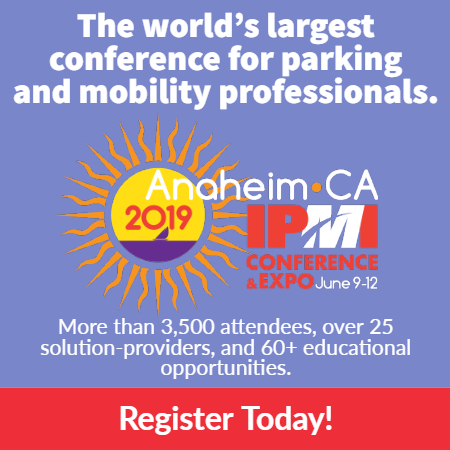 Developed at a cost of $100,000, the Toolbox consolidates lessons learned from peers into a process-driven approach that demystifies parking management and facilitates operations. It lays out meaningful strategies and the intended benefits of each solution. Most importantly, the Toolbox’s strategies can be applied in any community, university, or entity to help determine the logical steps in the evolution of their parking programs. 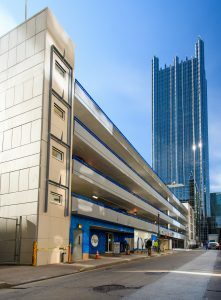 The $7.4 million Third Avenue Garage was the largest capital repair project in the 73-year history of the Pittsburgh Parking Authority. With five stories of above-ground spaces for 600 vehicles, its architectural profile remains attractively compatible with surrounding streetscapes. Its largely transient customers range from university students and visitors to ice skaters on the adjacent rink. The garage also houses a busy parking court, shoe repair service, and a bicycle parking and maintenance area. Its construction presented many building challenges. Only 200 spaces at a time could be disrupted; nearby dormitories required that construction end at 10 p.m.; and complete closures could only take place on holidays and weekends. Hydro-demolition doubled the pace of work and reduced the need for dustproofing. Its two one-way helix entrance/exit ramps necessitated a scheduling strategy limiting two-way use along with a traffic light system to ensure worker and patron safety. Because of the need for a steady revenue stream, the garage remained open despite its slab’s damaged condition, requiring structural support that permitted load transfer to the steel frame. Partners HealthCare‘s $56 million, seven-level garage was an integral part of the 2015 master plan for its new corporate campus, which would consolidate its 15 offices scattered across Boston and create an outdoor space that would be enjoyed by the Somerville community. Sustainability was a major focus. The $56 million garage features an elaborate LED lighting system, a massive solar photovoltaic array that provides power to the garage and an EverSource power grid, and a sophisticated parking guidance system. The solar array is a Power Purchase Agreement (PPA) with Ameresco .The sustainable features have yielded a 20 percent reduction in search times, resulting in reduced CO2 emissions; a popular community green space; and spaces for more than 100 bicycles. Future plans include electric-vehicle charging stations and vehicle ride-sharing options.